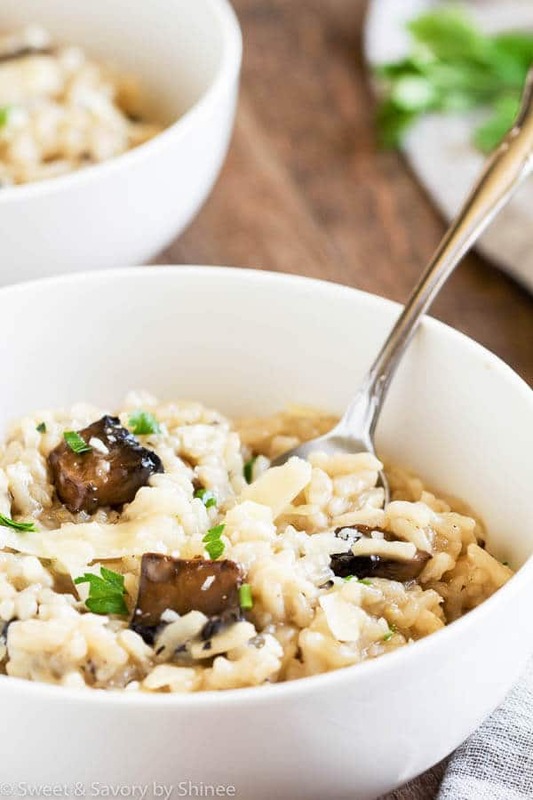 Lusciously creamy and soft, this no stir pressure cooker mushroom risotto comes together quickly and effortlessly. Impressive for company, yet total comfort food! But since having Grant, I have no such luxury. Most nights, I need to have dinner on the table like 10 minutes ago. Well, imagine how delighted I was when I came across this pressure cooker risotto on Cook’s Illustrated. Ok, I didn’t just come across, I was actually looking for simplified version of my favorite meal. I immediately put my then-new Instant Pot pressure cooker to the test. 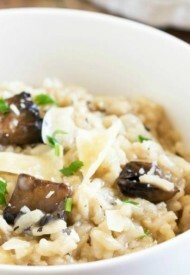 And as a result, I got creamy, nutty and rich risotto with minimum effort! Bingo! Best rice for risotto? Arborio is the most common short-grain rice for risotto that is high in starch, which makes the risotto creamy and thick. 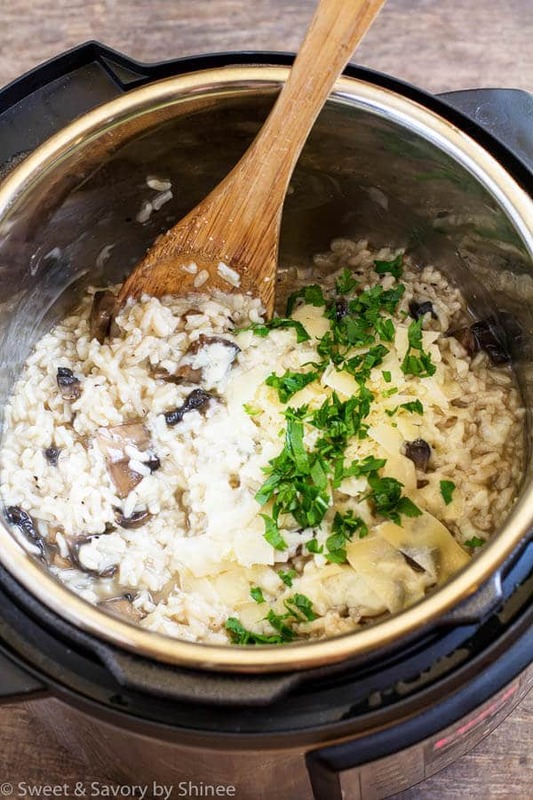 You can’t substitute long grain rice, such as jasmine, for risotto. It just won’t work. To wash, or not to wash risotto rice? No, you don’t need to wash the rice for risotto. In fact, you shouldn’t. You need all the starch for that creamy goodness. Reheating risotto is a bit challenging. That’s why it’s best to eat it right away. But if you’ve got leftovers, simply reheat it with added stock to make it creamy and saucy again. You can use variety of mushrooms for even more robust flavor, but simple portabella was perfect for an everyday meal. Also, if you have leftover rotisserie chicken on hand, toss them in! It makes a great addition. I’m so loving my Instant Pot. If you don’t have a pressure cooker, I highly recommend this multi-functional cooker. 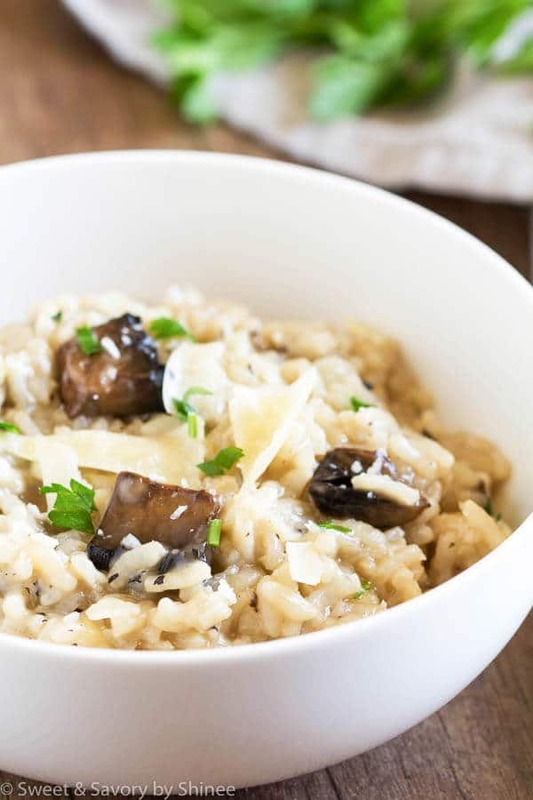 It’s a life-saver for lazy nights and perfect for this mushroom risotto easy way. What I love the most about this pressure cooker is that you can sauté/sear your food right in there before starting the slow cooker, or pressure cooker. All in one pot! 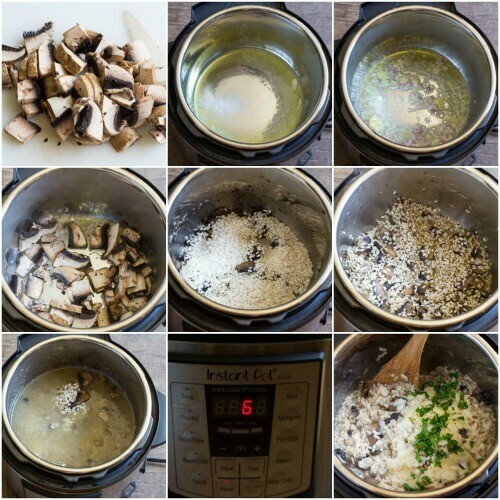 I urge you to try this easy and delicious risotto. If you do, please let me know your feedback. Love reading your reviews! Add shallot and garlic and cook until fragrant. Add mushrooms and cook softened, about 5 minutes, stirring occasionally. Add 3 1/2 cups of broth and give it a good stir, scraping up the bottom. Set Instant Pot to manual and set the timer to 6 minutes. Release the pressure and carefully open the lid.